Captain Bartholomew Diaz was the leader choosen for the planned expedition to India. Diaz oversaw the building of two new ships for the expedition to India, and he had two older ships refurbished. 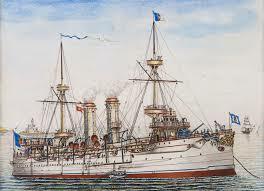 All the ships were armed with the improved cannon that had recently been developed in western Europe. Berrio, São (Saint) Gabriel, and the São (Saint) Raphael were the ships of vasco d agama. The Ship type was a carrack, also called a nau, was a three- or four-masted sailing ship developed in in the 15th century by the Portuguese. Four ships left Lisbon on July 8, 1497–the Sao Gabriel, on which da Gama sailed, the Sao Rafael, the Berrio, and a storeship. They stopped in the Cape Verde Islands; from there they did not follow the coast, as earlier expeditions had, but stood well out to sea. They reached the Cape of Good Hope region on November 7. After one further stop on the Indian coast, the Portuguese set out to return with a load of spices. They took three months to recross the Indian Ocean, however, and so many men died of scurvy that one of the ships, the Sao Rafael, was burned for lack of a crew. The expedition made a few stops in East Africa before rounding the Cape of Good Hope on Mar. 20, 1499. The ships were separated off West Africa in a storm and reached Portugal at different times. Diaz made certain that the ships of the new expedition carried enough food to supply their crews for three years with generous rations of wine, salt beef, biscuits, lentils, sardines, plums, almonds, onions, garlic, mustard, salt, sugar, and honey. Diaz also made sure that the ships were supplied with the sort of goods that had proved useful to him in trading with the primitive natives who lived on the West Coast of Africa. These goods included glass beads, copper bowls, tin bells, tin rings, striped cotton cloth, olive oil, and sugar. 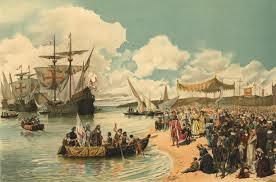 Although Bartholomew Diaz prepared the ships, Vasco da Gama personally recruited his crews for the expedition. His one hundred and seventy crewmen included ten convicted killers, whose death sentences were commuted so that Vasco da Gama could use them for suicidally dangerous missions. Portugal continued to trade with India and became a very rich and powerful country. Thus in 1502 Da Gama returned to India for a second time to claim the land for Portugal. On this voyage, however, he only brought 3 ships: the Challenger, the Discovery, and the Enterprise. By this time, the trade routes had been expanded, and most commerce between the countries was happening by way of rail and air. Da Gama was not welcome this time, however. His presence was a threat to many of the other shipping companies that had begun trading, including Federal Express and UPS. Their workers were angry that Da Gama was trying to resume trade, and they attacked his ships without warning. Many battles ensued.